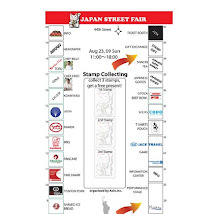 The NYC Japan Street Fair: The NYC Japan Street Fair Debuts at the Daytop Madison Avenue Festival on August 23, 2009! The NYC Japan Street Fair Debuts at the Daytop Madison Avenue Festival on August 23, 2009! Hi everyone! Welcome to our blog! Just wrote the press release - help us spread the word! NEW YORK, New York, (July 22, 2009) - On Sunday, August 23, 2009, the NYC Japan Fair will make its debut at the Daytop Madison Avenue Festival, one of New York's largest street fairs that spans 15 blocks – from 42nd to 57th Streets – and attracts 10 million visitors annually. Hosting a diverse array of companies specializing in distinctly Japanese products and food, the NYC Japan Fair invites New Yorkers to immerse themselves with the rich culture of Japan for a day, while using the event as a test market to introduce new Japanese products to the U.S. The Fair’s approximately 40 booths offer everything tangible about Japanese culture: food, merchandise, performances, and activities. In one place, visitors can sample such delectable fare as miso-marinated beef, roasted mochi, and okonomiyaki, a multi-ingredient savory pancake. Tenugui, traditional versatile Japanese towels, manga, J-Pop goods, calligraphy lessons, martial arts performances, and other cultural exhibits are just some of the few Japanese products and activities of note there. Well-known Japanese household brands such as Marukome, Hisamitsu America Inc., Ajinomoto, Otafuku Foods, and Kikkoman will be participating in the festival. In addition, local Japanese restaurants and companies familiar to New Yorkers will be represented, including Café Zaiya, Washoku Café, and Bookoff. Lucky visitors can also win round-trip tickets to Japan and be awarded gifts from the NYC Japan Fair's supporters with special purchases. Part of the proceeds from the NYC Japan Fair will be donated to Daytop, a drug-free counseling organization. Follow the Fair on Twitter (@NYCJapanFair) and read its blog (nycjapanfair.blogspot.com) to keep up to date about the its unique offerings and to learn more about Japan! Do you mean its address in Google Maps? It's on Madison Avenue between 43rd and 44th streets. The Fair will be happening on Sunday, August 23, 2009. What time does it start? What time does it end? It starts at 11 AM and ends about about 6 PM.